Varnishing, framing, and a new painting started. Made it to my studio yesterday after a busy weekend at the inn. I have some paintings being shown at the "Summer Art Celebration" at The Next Picture Show this coming Friday. I picked up my 3 paintings to be shown from my photographer last Saturday. So, yesterday, I framed two of them and varnished the "Blue Irises." The latter is on gallery-wrapped canvas and doesn't need a frame. 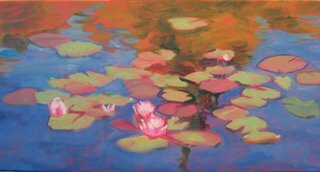 Once that was done, and I was sufficiently buzzed on the varnish fumes, I started a small oil from one of my water lillies photos I took a couple of weeks ago in Princeton, IL. It's 12" x 24" and this is just a couple hours worth of work. The next time I'm at the studio, I'll lay in the darker greens and blues. Hopefully, it will be just be one more day at the canvas for this one. The lillies are kind of fun. I might do all kinds of sizes in both oils and acrylics for this series.